Do androids dream of electric sheep? A question Neill Blomkamp’s third feature (co-written with his wife Terri Tatchell) approaches with a childlike sensibility, often recalling the PG-rated Short Circuit (thankfully minus Fisher Stevens browning-up) and blending it with the trappings of an ultra-violent 80s action movie like RoboCop. 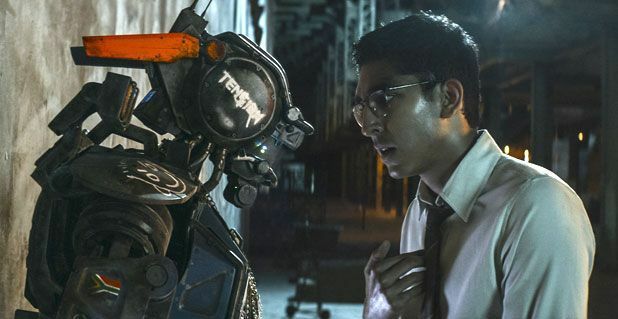 Deon Wilson (Dev Patel), the lead developer at a weapons plant run by the tough-talking Michelle Bradley (Sigourney Weaver), steals and reprogrammes a defunct police enforcement robot to give it self-awareness. When he is kidnapped by a gang of misfits – Ninja and Yolandi (from rap-rave duo Die Antwoord) and Amerika (Jose Pablo Cantillo) – they force him to hand over the machine, so they can use it in an evil scheme to pay off the leader of a drug cartel. A badly dressed and mulleted Hugh Jackman appears as a cartoonish nemesis to Deon. Blomkamp returns to his roots in Johannesburg, the setting of his first film District 9, to revisit themes he has previously tackled. His sincerity and infectious passion for sci-fi with a conscience make it easy to sympathise with the innocent droid Chappie (voiced irritatingly by Sharlto Copley, whose performance was motion-captured) as he's thrust into a violent underworld. He learns like a child and Yolandi believably adapts to the mother role in their highly dysfunctional family, making their relationship engaging. However, Ninja joins the ranks of many a rapper turned actor by being completely awful. The film commendably explores the effects of exposure to violence on children and humankind. While the action sequences may be engrossing and dynamic, packed full of bloodletting and massive explosions suitable for a mature audience, the philosophical debate on consciousness and humanity is rather simplistic and badly mishandled in a third act plot twist. This admirable misfire is often endearing and Chappie is creatively designed and feels real, but an unsophisticated approach to its subject matter combined with the slight characterisations edges it perilously close to the scrapheap. General release from Fri 6 Mar.